As stoic in demeanor and violent in action as ever, Matt Damon returns to the titular role in Jason Bourne after a nine year hiatus and a temporary series handoff to Jeremy Renner in 2012's The Bourne Legacy. And everything is just how you remember it. If you don't, and you're unfamiliar with the Bourne series, Jason Bourne is a highly trained government assassin produced by a top secret CIA project who went rogue after losing his memory. The government decides to try to kill him to cover up his failure, well, you can imagine where it goes from there. As the series progressed, Jason Bourne would go into hiding, and then something from his past would draw him back out, leading him to clash with the CIA again. Well, why mess with the formula? Once again, something from his past draws him back out, this time former CIA coworker Nicky Parsons, played by Julia Stiles, reprising her role from the first three films. Having stolen all the CIA's top secret black ops files, including those containing detailed knowledge of Jason Bourne's past and training, she contacts him, and arranges to give him copies so he can finally learn about his true identity. This leads Bourne on a fairly complicated series of twists and turns as he's pulled into a conspiracy involving anarchist hackers, a bitter assassin (Vincent Cassel), a Silicon Valley social media mogul (Riz Ahmed), and his latest CIA nemesis (Tommy Lee Jones). 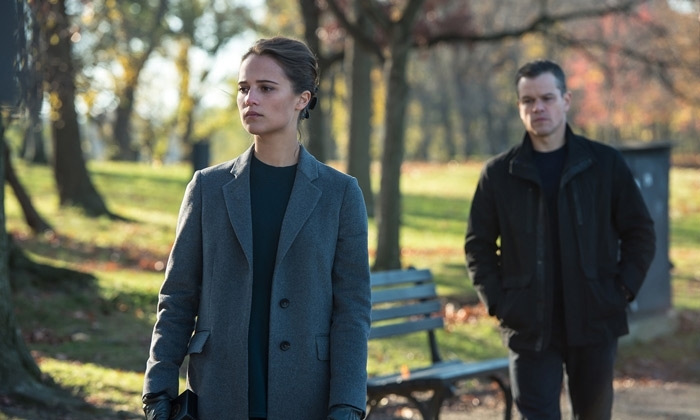 Nestled in between is the ambitious young CIA cyber-warfare hotshot tasked with hunting him down (Alicia Vikander). If that last name rings a bell, Alicia Vikander is best known for winning the Oscar for Best Supporting Actress for The Danish Girl, and her excellent performance as the robot in last year's lauded indie thriller Ex Machina. And she once again does an excellent job playing a robot in this film too. Oh, wait. It's hard to nail down if she just wasn't getting good direction, or if her efforts to conceal her accent stilted her delivery, but she just felt very wooden the entire time, like she knew the lines, but wasn't sure exactly how she was supposed to say them. If you remember her fellow Academy Award winner Natalie Portman in the Star Wars prequels, you'll have a pretty good idea of what I mean. Fortunately this doesn't detract from the film too much as most of the action follows Matt Damon and she splits time with Jones and Cassel, and you probably weren't here for the acting anyway. The bottom line is, if you liked the other Bourne films, then you'll like this one. It's a fun, fast paced sequence of action scenes, with a somewhat needlessly complex but followable plot that will take you across Europe from Greece to Germany to London and finally stateside to Las Vegas, as Bourne punches people, shoots guns, rides motorcycles, wrecks cars, and the CIA does its level best to track him down with an army of dudes to get punched or shot. The action is fast and visceral, even if it's not going to win any points for originality aside from a vehicular pursuit down the Strip. 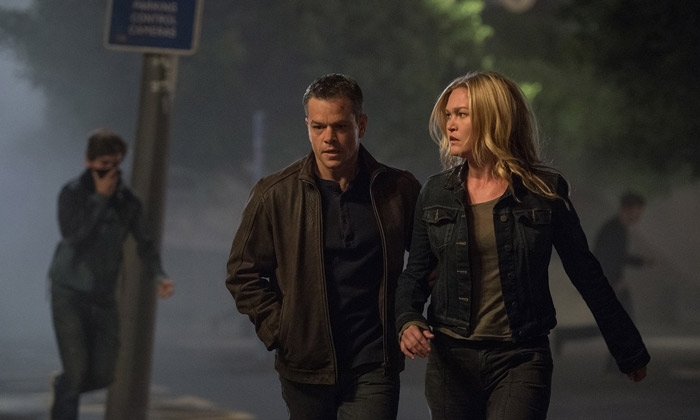 One might wonder if the super agent spy thriller genre is starting to wear thin, or if as an audience we're just getting tired of the onslaught of “The CIA is watching everything you do and that's bad!” plot hooks, but in Jason Bourne's case, it still manages to serve up an enjoyable summer thrill ride. And, of course, just enough room for another sequel. Jason Bourne opens in theaters on Friday, July 29.